If you find yourself falling into this category it is important that you don’t take your safety for granted. Know Your Route – Before heading out make sure you know exactly where you’ll be running. This way you can determine if there will be any obstacles in your path, if you’ll be cut off from the main road or if there is poor lighting in certain areas. Knowing where you are going will mean you can remedy the route to avoid bad spots. Stay in Well-Lit Areas – By doing so you can avoid any unnecessary surprises as you stumble upon individuals you wouldn’t want to meet. It also means that you’ll be able to see where you are going and avoid unwanted injuries that are more likely to happen in dark areas. Avoid Listening with Headphones – In most cases, joggers will tend to listen to their music while jogging, after all, it’s a good way to stay motivated when a fast, upbeat song comes on to keep the legging going. It is, however, dangerous. Not only are you unlikely to hear car horns, trucks or bicycles, but you are unlikely to hear if someone is running up behind you. Carry Pepper Spray – In order to ensure your safety, it is always a good idea to carry pepper spray on you when out jogging, regardless of where you are going. Make sure that you have this device close to hand so that you can utilize it when needed. Nowadays, most runners will carry a self defense device because they know it’s non-lethal, but extremely effective in stopping an assault. Get a Jogging Partner – The easiest way you can avoid becoming an easy target is to get a jogging partner. 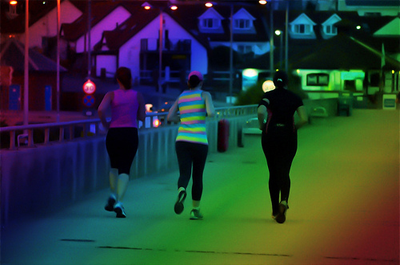 People jogging together are less likely to be targeted than someone who is jogging alone. Not only will you be staying safe, but you’ll enjoy your running workouts now that you have someone with you.